Didn’t we tell you that all the hubbub at the U.N. over Aleppo had to do with extracting foreign terrorists working for the CIA, MIT, MI6, Saudi “intelligence”, Jordanian “intelligence” and others? Didn’t we? Now Dr. Ja’afari, Syria’s permanent delegate to the U.N. has even announced some of the names of the rodent foreign agents inside the city – unable to escape despite every stratagem imaginable. Kerry’s hilarious posturing, France’s hard-to-endure buffoonery, England’s self-important ostracisms, Al-Jubayr’s nonsensical pretentions – all meant to somehow embarrass Damascus into dropping its guard to allow these stinking perverts to escape justice. Well, not so fast! Dr. Ja’fari listed some of the foreigners already at the U.N. But, that’s not all. But, that’s not all folks. There are still another 10+ Americans in there. There are 2 limeys. There are some French rodents of Moroccan descent still in there. All will be captured and paraded before the cameras in a short time. It’s over. It’s curtains. Obama’s legacy will be seen soon on television all over the world. Turk imbecile and terrorist, Mevlut Mert Altintas, after having killed the Russian ambassador to Turkey, Andrei Karlov. This was no accident. This is an extension of Erdoghan’s war against the world. Amusingly, Erdoghan is trying to blame Fethullah Gulen arguing that Altintas worked for the Turkish renegade cleric who lives in Pennsylvania. That begs the question: if you arrested everybody linked to Gulen, why did you leave this terrorist cop in the security forces, specifically the anti-riot police? What nonsense. It is with a heavy heart that we at SyrPer bid farewell to a career champion of diplomacy and human rights. To his family, friends and compatriots, we express our deepest sympathy for his passing at the hands of a maniac Turk freak of nature. Andreij Karlov will be remembered for his loyalty and his commitment to the profession of diplomacy. Farewell. In pace requiescat. South Front - Syrian War Report – December 20, 2016: What Is Syrian Army Going To Do Now? Parade all foreign agents and make them march on the main Street of Aleppo, followed by street cleaning trucks washing and cleaning where they dirty foots just walked. Ron Paul Liberty Report - Global War On Terrorism: Are We Winning? Likely twin terror attacks in Berlin and Ankara remind us of the dangers we face. But has the US war on terror been successful at all in reducing terrorism? Or is it actually perpetuating it? The imminent capture of the foreign operatives in Aleppo must be driving the insane antics of S. Power and Co. Thanks Ziad, sad event with the Russian Ambassador, though expected coming from a turkish terrorist, an extension from a regime that support terrorism for years. May the foreign agents in Aleppo be imprisoned and treated as the US treats all the people the detain, an eye for an eye. “A Russian diplomat has been found dead from gunshot wounds at his home, it is reported. Petr Polshikov, 56, was discovered with a bullet injury to his head at his flat in Moscow’s Balaklavsky Prospekt, according to local media. The best Christmas gift I could win would be the public display of the bunch of foreign murderers surrounded in Aleppo, a summary public judgment and the public execution – by hanging – of all of them. Americans ahead. But I know I will not get the gift …damn! Thanks Ziad fro this update. May the Soul of Ambassador Karlov Rest in Peace! Outside of the alt media, I don’t know of a single journalist or publication that hasn’t sold its soul to the devil. I’m hoping we’ll get a good account of all the dirty secrets to be found in the former terrorist stronghold in East Aleppo. may God have mercy on the russian ambassador, killed unarmed from the back by a coward. i think the zionist empire will have their operatives in aleppo killed rather than having them paraded for all to see. shot or by a fighter bombing their position in the night. i have heard that syria has called for all reservists age 18-55 to deploy. is this a sign that something is afoot. Erdogan needs to be removed from power at any cost, he is toxic! i’ll believe it when i see them paraded through the streets or interviewed in a jail cell. Govts always do back door deals. sorry, but i’ll only believe it when i see this foreign intel scum in a jail cell or paraded through the streets. Govts are always doing back door deals even with the “enemy”. Ziad as usual you LIE! Some of those countries have NO intelligence. 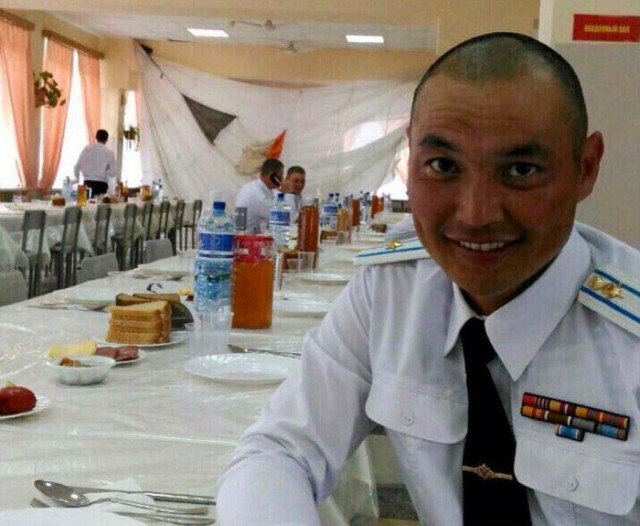 Sanal Sanchirov,37.Russian commander Paratroopers’ Assault Battalion of 56th Separate Airborne Brigade Killed In Action Dec. 8 near Palmyra. A meeting between representatives of Iran, RUssia and Turkey has taken place in Moscow to discuss common views on the problems relating to Syria. An article relating to the absence of protection teams for Russian diplomats in Turkey. Basically, the Turks have, for 10 years, been against armed foreign troops protecting diplomats (presumably for all nations?). Currently protection is provided by available (possibly non-specialist) embassy staff. The assassination will probably change all of this. The article provides images of the sort of protection team following Lavrov in Afghanistan, Iraq, etc. My deepest sympathies to the family of Andreij Karlov. Totally senseless murder of a diplomat. UPDATE: December 20. 2016, Late Evening News | 2012: What's the 'real' truth? Just when you think the corporate media cannot sink any lower… it sinks lower. Now a NY Daily News writer Gersh Kuntzman justifies the terror slaying of the Russian ambassador, and compares Putin to Hitler. This madman should be fired and branded as a lunatic. But this is the norm these days. Israeli Terrorism expert Shlomo Shpiro is appearing on German TV and giving interviews to German newspapers describing the Berlin Christmas market attack as Germany’s 9/11. Tony Cartalucci - Russian Ambassador Assassinated: Retaliation, But by Whom? US President Barack Obama, US policymakers and pundits, as well as US Senators for the past week have vowed “retaliation” against Russia for alleged “hacking” during the 2016 US presidential election. These threats take place against a wider backdrop of increasingly unhinged outbursts made by Western politicians, pundits, and policymakers amid frustration in advancing their global agenda versus a reemerging Russia and a rising China. It’s rare for Americans to hear any version of the Syrian conflict other than the simplistic accounts favored by the U.S. government and the mainstream news media that rely heavily on “rebel” sources and their international supporters who often traffic in propaganda. While it might seem too much at this stage to suggest a potential American exit, some developments have clearly shown that the century of American and Western imperial supremacy in the resource rich region is over. Defeat in Syria is not just of military nature; it equally symbolizes and effectively stamps the rise of forces which are no longer willing or weak enough to subordinate their interests to that of the West and its Arab allies. Dear friend, please help me! In my country, Romania the new prime minister is miss SEVIL SHHAIDEH, a women, muslim, tatar ethnic, maried with AKRAM SHHAIDEH a sirian citizen! From declaration of wealth have 4 properties 1 in Romania and 3 in Siria! Please send me something about mister Akram ! (where are the properties in Siria, have tribal afiliation or political, is a big family, have influence in Siria or alswere). Thank you, Ziad and also to yours readers! Aleppo: The number of insurgents and their families who are still in the eastern neighborhoods of Aleppo is about 2,500 people. The last hospital in Eastern #Aleppo is now empty. All patients have been evacuated, along with other people in need of urgent medical care. Muslims always “CARRY” their ID? what a sick pathetic JOKE! Did Anis A refuse to carry out the assasination of the Russian ambassador or does he KNOW TOO MUCH.